Annmarie Skin Care > Skin Care Tips > Which are Better: Oils or Lotions? When standing at the skin care aisle of your local market, it’s no doubt that you’re probably vortexed by the plethora of moisturizing options. After browsing through pretty labels and maybe a little sampling, you either end up with an oil or lotion in your cart. What’s the difference between the two? Aren’t they both going to offer the same moisturizing benefits? This is yet another “skintroversial” topic. Both options can be incorporated into a facial and body routine, and each contain their own unique benefits for maintaining beautiful skin. Who doesn’t love a silky body lotion? Luxurious, creamy, buttery and whipped. You name it, they’ve made it. Lotions are created by blending oil and water together. However, since oil and water do not mix on their own, wax is needed to emulsify them. Depending on the ratio of these three ingredients, the end result ranges from a light textured lotion to a heavy cream. 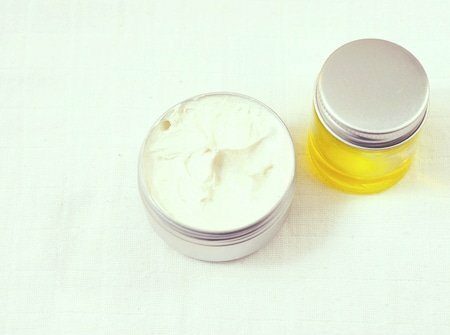 The presence of wax in face and body lotion formulas creates an “occlusive” layer on the skin, which locks in moisture. While this sounds ideal for those with dry skin types, wax can potentially build up on the skin, leading to clogged pores and breakouts. Also, since oil is a more active ingredient, and wax is more or less a “filler” ingredient, this waxy build up may prevent the amazing nutrients from the oil from actually penetrating into the skin. Another downfall of lotion is that the presence of water in a formula requires some type of preservative to keep mold and bacteria from growing inside the product. Unfortunately, most preservatives on the market today are toxic and not skin-friendly. Truly “natural” preservatives are rare, so checking labels is a must and we encourage you to find the cleanest options! We use Aspen Bark Extract to preserve the integrity of our natural formulas. Lotions definitely bring something to the table. But as you go through all of that trouble of lathering on your daily moisturizer of choice, you might want to consider if your skin is would receive more benefits from an oil-based formula? If you’re familiar with Annmarie Skin Care, you know we’re a huge fan of oils. They are the primary base for the majority of our products (with a lot of love and herbs infused into them!). I like to refer to oils as the ‘crème de la crème,' because they are an essential component of your typical lotion or cream, and can also be used alone for superior moisturization. In fact, pure oils have been used for thousands of years in ancient beauty rituals from around the world. Oils have extremely high nutrient and antioxidant levels. They are 100% active and are easily absorbed into the skin since they don’t contain any fillers. As we age, the oil (sebum) that our skin produces starts to deplete, so it only makes sense to replenish the lipid barrier by applying oils that our skin will lovingly soak right up! See, if we don’t lubricate the skin effectively, then fine lines and wrinkles start to show up. A common skin care myth is that oils will clog pores and make you break out, especially for acne-prone skin types. This is wildly untrue! Oils have the amazing ability to balance the skin. Let’s ditch the oil-free hype because all skin types can benefit tremendously from these gifts of nature. Try our Herbal Facial Oil for Normal and Combination Skin which is in a base of grapeseed oil, a very light-textured oil suitable for even the most sensitive of skin types. Do keep in mind that the quality of an oil also reflects its performance on the skin. Look for oils that say “cold-pressed” or “CO2-extracted.” Always choose organic when possible and avoid chemical additives such as fragrances (parfum). Oils are often infused with herbs, so if the ingredient on the label are names of flowers and plants, you’ve likely found a good quality oil. Your skin is just waiting to take in all the juicy benefits! Next time you need to re-stock your moisturizer, experiment with what responds and works best for your skin type. We recommend oils because of the amazing benefits, but some people also love using lotion like Radiant Skin Silk on their faces and have great results. What moisturizer do you prefer? What noticeable benefits have you received from oils? Share with us! Winter, Ruth. ‘A Consumer's Dictionary of Cosmetic Ingredients: Complete Information About the Harmful and Desirable Ingredients in Cosmetics and Cosmeceutical’. Harmony; February 10, 2010. Aguino, Kathy. ‘Skin Care Oils: Natural Plant Oils For Your Face, Body, And Hair’. Amazon Digital Services. November 29, 2014. Happy to have discovered your website! Just FYI though, I tried to take the quiz to find my “Skin Score,” but the link took me to a blank white page ???? Please let me know if the quiz returns. Great post! Oils have made a huge difference in my skin. I love that they are so concentrated. My own oil production has normalized since using oils on my skin. I used your anti aging oil in the winter and just ordered a sample of the herbal oil, which I also love. Coconut oil is wonderful on my body. I’ve posted reviews of many of your products on my blog. Annmarie Gianni is the first company I have found that makes truly natural products that are also highly effective. Love them! Wonderful, beautiful article! Aestheticians need to know this information and so do our clients! Most people can’t get that “oil clogs and makes me break out” myth out of their heads. Thank you for sharing all of your wisdom and creating such a beautiful product line, Annmarie. I absolutely LOVE using oils on my skin, and have only recently, within the last year, discovered their amazing benefits. The only concern is making sure that I’m also protecting my skin from harmful rays, so I use an organic moisturizer with an SPF, during the day and on top of my oils, for protection. How do you feel about that? Do you have a better recommendation for me? I appreciate your advice, and I’m eager to hear from you. My recommendation for optimizing the oil absorption is to simply spray a toning most of your choice after you apply the oil. Water increases skin permeability, therefore the oil drives into the skin deeper 🙂 this will also dilute the oil a bit, for those who get that “greasy” complexion after applying an oil. Don’t forget to gently massage it into the skin ! I’ve tried a multitude of oils and oil blends on my skin as my moisturizer (incl. your herbal facial oil and anti-aging oil), and they just do NOT work for me despite how MUCH I wanted them to. No matter how little I use, they all just SIT on my skin (even after rubbing in, obviously) making it look downright greasy. Even rosehip oil, which is said to be one of the more drying oils, doesn’t work for me. As a result, I’ve defaulted to using serums (which I quite like) and facial creams/moisturizers. I don’t understand why the oils behave that way on my (facial) skin, though. Has anyone ever encountered that or had a similar experience? Admin, any insights? That’s great that the serum is working so well for you! Aloe absorbs really easily into the skin, and both of our serums do include a bit of oil, so are you are getting the moisturizing benefits as well. My advice for you, if you’d like to use a facial oil, would be to exfoliate first with something like our Dead Sea Scrub. http://shop.annmariegianni.com/Dead-Sea-Scrub-50ml_p_33.html This will help you absorb the oil better. Oh, I mistakenly hit the post too soon & you answered before I could finish! expecting a plumper feeling of moisture, is just because I am so used to feeling all that wax filler? Lr what else do you recommend? I love all oils & healthy lotions & creams! For extra moisture, try our Coconut Honey Mask. (http://shop.annmariegianni.com/Coconut-Honey-Mask-50ml_p_24.html) The honey helps bind the coconut oil to your skin! For more plumpness, try our Anti-Aging Serum (http://shop.annmariegianni.com/Anti-Aging-Serum-15ml_p_19.html) Hyaluronic acid in this formula helps the skin retain more water, making it more plump and firm. I have tried various oils on my body, however in the winter when the skin tends to dry out… with even the natural oils, my skin wildly itches and flakes, whereas if I use a lotion that does not happen. Any comments about that? I had the same problem with really dry, itchy skin in the winter … and even lotion could not tame it after a few months, even after trying several different “intensive” brands. There’s a recent article here at AG about the need for both hydrating (with water) and moisturizing (with oil) to keep your skin happy. Hope this helps! PS – I use either St Ives Body Wash Creamy Coconut Triple Butters or Aveeno’s Skin Relief Body Wash, followed by Neutrogena’s Fragrance Free Light Sesame Oil (AG’s coconut oil, rosehip, or argan oils work well too). I love ALL the Annmarie skin care line, my favorite being the eye cream and Rosemary Toning Mist. I also use Annmarie’s other toners, serums and oils. Usually I have excellent results with all her products however this has been a particularly cold, dry winter in the East(I live in Vermont). I don’t find the oils are absorbing into my skin the way they do in the summer. So I have complimented my skin care regime with a moisturizer from Tata Harper’s line ( Repairative Moisturizer). Tata Harper has a farm in Vermont where she grows many of the herbs used in her products. I love that both these ladies make wonderful products. Thank you!! Hi Lisetta! One trick you might use is exfoliating before you put on your moisturizer so your skin really absorbs it. I am in my 60’s and use your anti aging serum, the anti aging oil as well as your sun screen. I wait a few minutes before I layer each product, but still my face stays very shiny long after application. I love the feel of your products and would like to continue using them. Please let me know what I am doing wrong, or do I need to add powders to hide the shine. If your face is looking shiny when you do this routine, I would recommend skipping the Anti-Aging Facial Oil in the morning. You can use it at night, since you won’t be using your Sun Love at night. I hope this works! I am rather new to using the AnneMarie oils. Is it ok to mix it up? Use my old lotion (until I run out) say in the morning and use my AM Oil in the evening? I have been using argan oil, how do you feel about that? I absolutely love the oils!. Anti-aging serum and anti-aging facial oil are my go-tos. I have not had any dry or flaky skin since starting with Annmarie’s products. We also love the Coconut body oil, as well as the Radiant Skin Silk . I got the Radiant Silk first, and while I love it, I am using the Coconut oil more, as is my husband – his hands and fingers can get super dry, and crack. No cracks this year! I am currently using a mixture of coconut oil and bonus oils such as grapeseed, almond, or jojoba. I am expecting a sample kit from you soon and I am happy to see you favor oils to lotion.